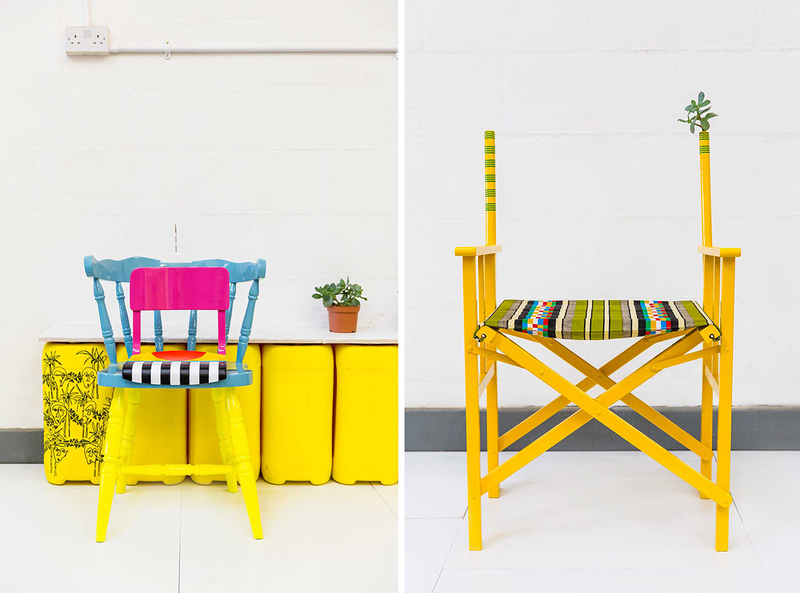 Yinka Ilori may be an artist and furniture designer, but he’s also a crafty teacher. 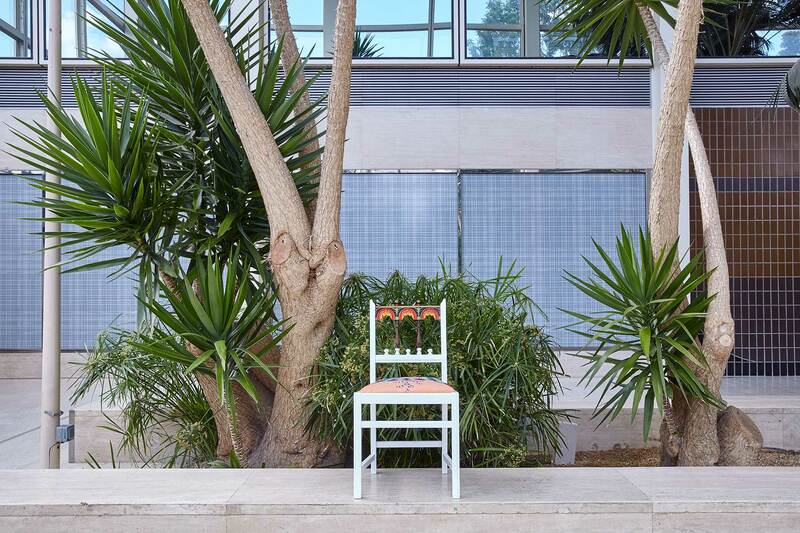 Underneath the playful West African fabrics and whimsical touches, sits a deeper message. Born in London to Nigerian immigrants, Ilori grounds all of his work in traditional Nigerian parables, and he uses those pithy lessons to transform discarded furniture into complex narratives about sexuality, religion, poverty and hierarchy. His furniture has been exhibited at the Guggenheim Museum Bilbao, The Whitespace Gallery and will be on display at London Design Week 2016. 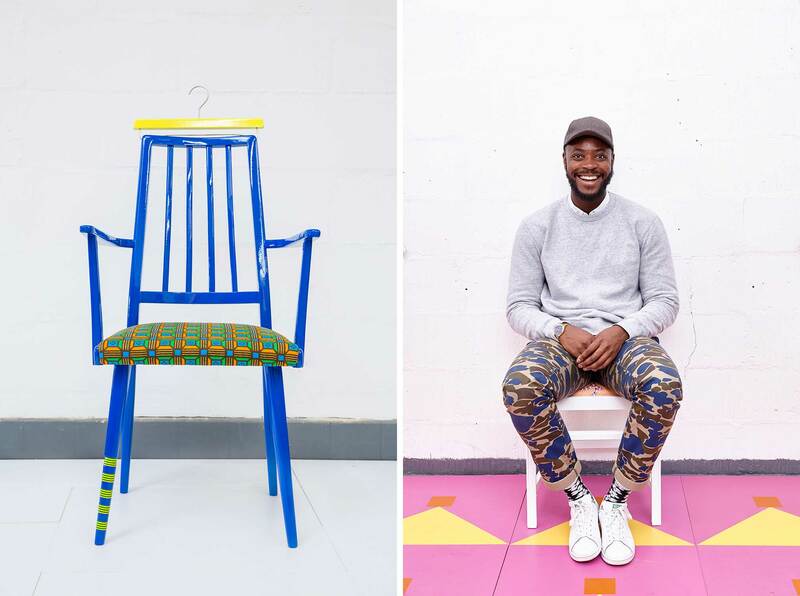 Ilori pulled up a chair with us to discuss the influence of his combined British and Nigerian heritage, the surprisingly brilliant colors of London, and how he uncovers the inherent personalities in each of his chairs. You’re known for using bright colors and West African patterns in your work. What would you say is London’s color palette? I’d say pink, orange, green, and blue. The weather is often gray, but the people make it colorful. London is very multicultural. You have white people, black people, and Asian people all mixed together. We’re like one big family. What colors do you notice in the cities that you travel to? I’d say yellows, lots of yellows. In Nigeria, the taxis are all yellow, and you share these taxis with so many different people you don’t know, and you speak to the taxi driver about seven different things. I love the interaction with people and hearing their stories. Because of the traffic, you can end up spending hours in a taxi, and it can become quite personal. I’ve also been to New York many times for work, and again there are so many yellow taxis. When I get in a taxi there with a driver from Nigeria, I feel like it’s destiny, like I was supposed to meet that person. We’ll end up having a conversation, and he may share some wisdom with me, and then I might share something with him. We’re sharing in our cultural heritage, but in a totally different country. How would your work be different if you didn’t live in London? I’m lucky because I have both a British heritage and a Nigerian heritage. I’m both. My parents came to London about 30 years ago to give us opportunities that they never had. I think my work would have been different if I didn’t have those two narratives. It gave me my identity and formed the artist that I am today. Being around other people who migrated here from countries like Jamaica, Uganda, and India has also shaped who I am. These people share my experience of belonging to a new culture, and I think that sense of belonging to a community is really important. What are some of the major themes that guide your work? Sexuality, religion, poverty, equality, and fairness are major themes for me. But I think the main things I really care about are hierarchy and status. I try to bring discomfort into my chairs, so the first thing you do is laugh. Once you’ve laughed, it’s easier to digest the message of the work. Can you tell me about one of your pieces that deals with hierarchy and status? With all the chairs, I usually settle on a parable first, and then I use sections of the chair to play with hierarchy and status. For example, in my piece “Let There be Light,” the backrest has four poles of different lengths, and each of those poles represents a person. By making them different lengths, I was tweaking the notion that the backrest’s role is to be comfortable and support the sitter. Then I added a candle to the fourth pole. My parents always taught us to treat people with respect regardless of what we achieve. You could be the owner of Topshop, Balmain, or Nike, but tomorrow that could all be gone. With “Let There be Light,” I was trying to point out that the candle may not be lit yet, but one day it’s going to shine, and it’ll be a really powerful individual. Do you research the parables that you use in your work or were they handed down in your family? They’re a combination of parables that my parents told me and my brothers and sisters growing up—parables that I thought were useless and a waste of time back then. Now when I’m going through a tough time or just meditating, I think about those parables and what my parents would say. Also, it’s just something Nigerians do all the time. If they speak to you, I guarantee that they will put a parable in there. If you watch a Nollywood movie, you’ll hear parables. They’re just good teachings. Which do you usually come up with first—the narrative or the chair? For me, it’s always the narrative first and then I see a chair. Trying to convey a message in the chair is quite hard, and trying to get the right object that translates it in a really simple way can be quite challenging. I want my work to be memorable, even if it’s something really small that people remember. 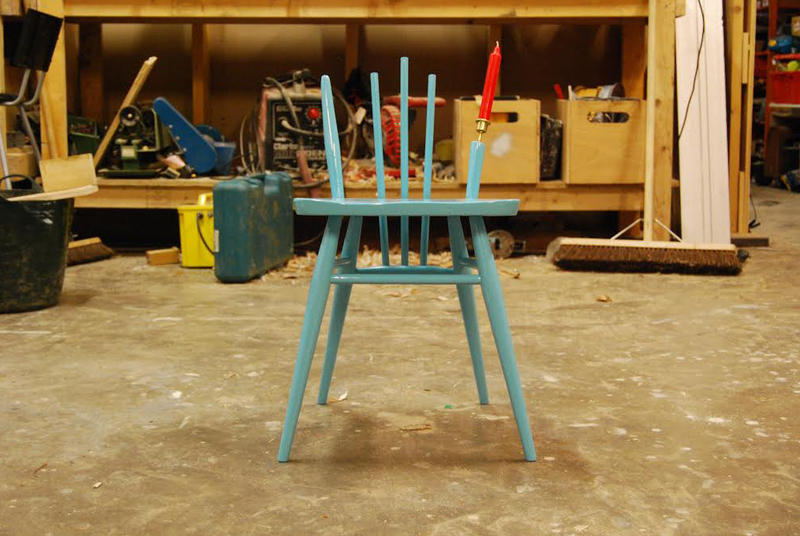 For example, I might add a hanger to the back of a chair or an odd chair leg to make the chair uneven. I try to avoid sketching the idea. Instead, I get the chair and I just sort of work as I go based on the narrative. I take out keywords and those keywords form the chair’s narrative. What is the story behind the most meaningful piece you’ve created? I would pick my last collection, “If Chairs Could Talk.” The underlying parable was “No matter how long the neck of a giraffe is they still cannot see the future.” In other words, no matter where you are, no matter what situation you’re in, things can change. 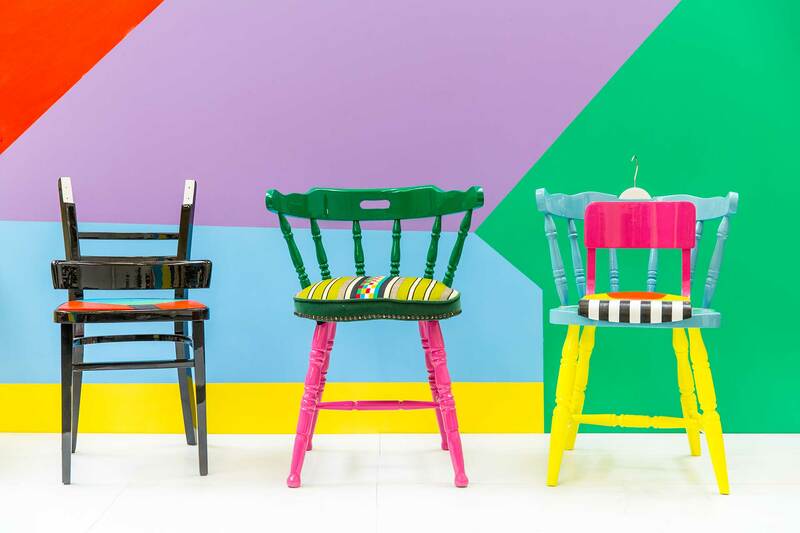 I based this collection of five chairs on five schoolmates. Growing up in North London, we all had quite similar backgrounds. We were Nigerian, Ugandans, or Caribbean, and we had parents who worked really hard to put food on the table. Most times they weren’t at home because they were working late nights to pay the rent. So many of the kids were out selling drugs or not doing what they should be doing, because their parents weren’t there to supervise them. I was interested in looking at people who had it handed to them on a plate, but didn’t appreciate the opportunity because it was free. I also wanted to look at young people I grew up with who were talented but the teachers didn’t give them that extra care or attention. Who were some of the characters in that collection? “A Trapped Star,” which is now in a museum in Brighton, is about a really talented guy I knew. He was good at football and music, but his brother was a gangster wannabe. He wanted to emulate his brother’s fast lifestyle, because he had money and girls. When you’re a young lad, you want that sort of thing, and it was so easy to go down that route. The piece is two chairs joined together. One is small and really colorful, and the other chair is a really huge captain’s chair. It’s meant to emphasize the star he could’ve become if he wasn’t trapped in this system, in this small chair. To sit in the chair, you have to sit on the small chair within the big chair. It’s not a comfortable way to sit, and that discomfort is part of understanding the narrative. I also put a hanger on the back, which represents the teachers who hung him up and said he’s done. He never reached his full potential, but it was in him. No matter how long the neck of a giraffe is they still cannot see the future. Do you want people to actually sit on your chairs? Are they meant to be functional as well? When I first started designing, I always wanted people to sit on my chairs. But then the press started writing about them as if they were art. Now I create work that is sculptural and work that is also functional. At one of my exhibitions, I was trying to get people to sit on the chairs, and they refused. To them, the chairs seem really precious and they thought it was wrong to sit on them. So sometimes have to force people to sit on my chairs, which is a bit weird. Do you see pieces of furniture like people with their own histories and personalities? I’ve always seen chairs as people. Just like we don’t always give people a second chance, we also throw away old furniture when it’s broken or it no longer fits the color scheme of our living room or kitchen. I find it quite sad because all of these chairs have their own story. That’s the beauty of chairs. They have their own narratives. Chairs also bring people together. You could be in a public space, at church, or a bar, and you sit down and you start chatting with someone. That’s what a chair can do—a chair can help you share really good moments and really sad moments. For example, I was watching this documentary on BBC called “Life on Death Row” that showed people speaking to their loved ones behind a barrier. I started thinking about the number of people who have sat on that chair and spoke to loved ones on death row and how much emotion has gone into that particular chair. Can you tell me about how you bring out a chair’s unique character or the history that’s already in it? I always speak to the person I’m buying the chair from, because most of the chairs I get are from the ’40s,’50s, and ’60s. They’re way older than me, and it’s nice to know their heritage and understand what kind of person would have used it. I might, for example, keep the upholstery of a particular chair because fabric that’s been used turns into a narrative. I might expose some of the wood because it shows a bit of the chair’s character. Then I add in my own heritage through my love for colors, which is really big in my Nigerian culture. I think the curation of color is so important. Anyone can apply color, but selecting colors is an art. When I’m selecting colors for my projects or my chairs, I don’t just choose red because red is colorful. I chose red because it means something. It can mean anger, rage, or passion. I’m curious to hear about the importance of humor in your work. The most serious things can be uncomfortable to take in or quite hard for people to understand. Sometimes people laugh at very unfunny situations because they’re shocked or they don’t know what else to do. I try to bring that discomfort into my chairs, so the first thing you do is laugh. Once you’ve laughed, it’s easier to digest the message of the work without it seeming too preachy. The first thing for me is always humor then the message. But under the humor is something powerful, something serious. I’m not a preacher, but I want to share a few things with you. And I think if it’s done in a light-hearted way, then why not. 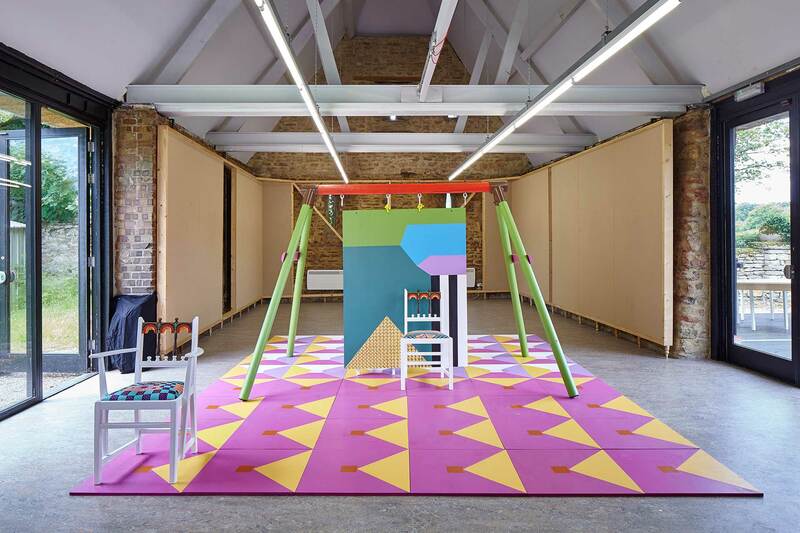 Tell us about “A Swimming Pool of Dreams,” your exhibit at the London Design Festival. This is quite a special one to me. It looks at my religious upbringing and my parents. We grew up reading the Bible and going to church every Sunday. Once a year, we’d go to the seaside town of Margate to pray as a congregation. We’d bring jollof rice and chicken. It was like a Nigerian carnival. We believed that when you’re by the sea, you’re closer to God. And then seeing people’s prayers come to pass later was crazy. You might think it’s coincidence, or that God didn’t have any part in it. But if you believe something is going to happen, that’s all you need, just that belief. How did you bring those stories into this installation? I’ve created a swimming pool using three sets of 64 floor tiles. Around the tiles on the floor, I’ve painted tribal faces. Inspired by Nigerian masquerades, the faces represent people who were going through different problems. In the center of the pool is an eclectic mix of Dutch wax prints, which represent people who went to the seaside and shared their problems together. At church, if you had a problem, it was everyone’s problem. So the people in the middle are surrounded by people holding hands praying for them. An amazing outburst of color, happiness, and joy comes through the center of the swimming pool, because their dreams have come true because of their community’s prayers. What’s happening now with religion, especially in Nigeria and the UK with ISIS, the religion aspect is getting lost. It’s getting confused. I’m trying to look at unity, faith, and religion, and the goodness of praying and being together, and what develops from that goodness. If you want to get a sense of culture and be inspired, I think East London and Dalston are the places to go. Dalston is this multicultural market. There are loads of textile shops. I can get my Dutch wax fabrics and African food, like yams, chickens, and rice, from there. I can get some Caribbean food. It’s a really nice place to get a sense of the UK.